I’m inaugurating this new website, A Medieval Woman’s Companion, which tells the stories of many girls and women who lived in the Middle Ages and inspired my new book, A Medieval Woman’s Companion: Women’s Lives in the European Middle Ages, a non-fiction book meant for high school and college students, as well as the general public. Here’s the book from Oxbow Books, a non-fiction book meant for high school and college students, as well as the general public. I hope you or your students will come visit this site periodically. You can read more about the creation of this website, including pages by students, here. You might wonder who that amazing woman is on the cover of my book. It’s Judith, whose story appears in a book of Bible about Judith and Holofernes. This particular image was created by Lucas Cranach the Elder who lived well into the 16th century. 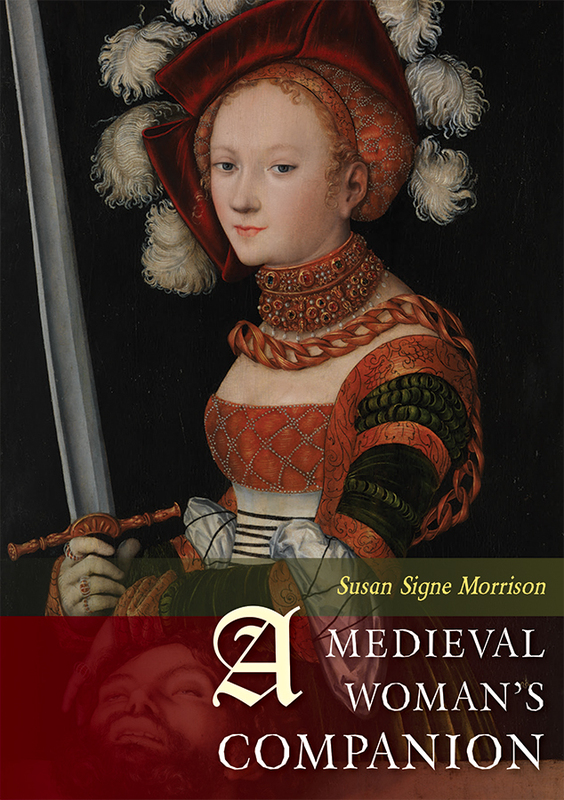 The drama of the color and Judith’s bold gaze at the viewer suggests much of what I want to say about medieval women: they were strong, innovative, and remain inspiring to us today. A number of medieval works mention Judith. One of my favorites is the Old English Judith which appears in the famous Beowulf manuscript, digitized here. Unlike the widowed Judith in the original text, the Anglo-Saxon Judith is a valiant virgin, adhering to late Anglo-Saxon Christian beliefs. The fifteenth-century deaf conversa Spanish nun, Teresa de Cartegena, also found Judith highly inspirational. I love Teresa! When men could not believe she wrote her first book, Grove of the Infirm, because it was too smart for a women to have written, she boldly responded in a new piece of writing, Wonder at the Works of God. How many women can use a sword, Teresa asks? Although most commonly associated with men, a sword was wielded by a mighty holy woman. Judith, a Jewish heroine and virtuous widow, defended her people oppressed by Assyrian forces. Their leader Holofernes desired Judith. She tricked him and, while he slept, she beheaded him with a sword. Returning to her people, she inspired them to victory. God made this happen, said Teresa, and could do so again. Teresa’s pen was a type of sword with which she defended herself and other women, defeating those who maligned her. It is blasphemous, she contends, to suggest that women cannot write as well as men since God is behind it all. Another woman after the Middle Ages also found Judith a great inspiration. 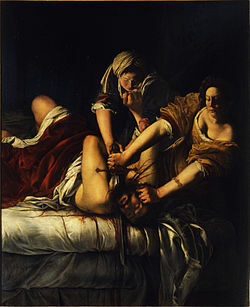 Her name was Artemesia Gentileschi. There numerous luminous paintings by her, including some of Judith. Be sure to see how Judith’s legacy extends over millennia. 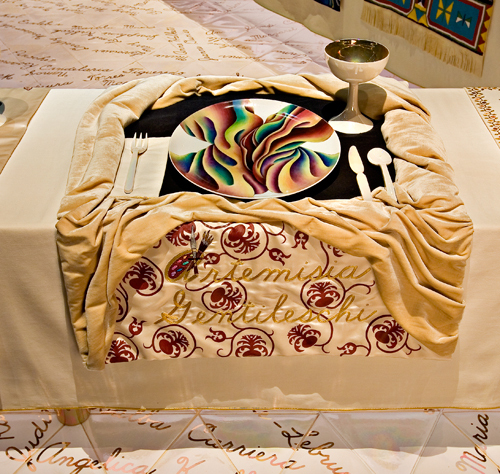 In Judy Chicago’s great artwork, The Dinner Party, one of the place-settings is dedicated to Artemisia. From Judy Chicago’s The Dinner Party. I hope you will read about them and find them inspirational too.